Sunquick Concentrate is our founding product. It’s also the very heart of the Sunquick brand. Developed by the Petersen brothers in the 1960s, Sunquick quickly set the standard for fruit-based drink concentrates worldwide. Decades later, it is now one of the world’s most popular concentrates, sharing the joy in over 70 markets. Sunquick Concentrate has been loved and trusted by generations. 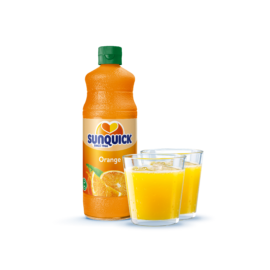 Inspired by nature and available in Orange and a wide range of fruity flavours, Sunquick is made with fruit juice and free from artificial flavours, colours and sweeteners. It also provides vitamin C. With its distinct, rich and refreshing taste, each bottle of this premium-quality concentrate contains many glasses, and is the perfect refreshment to be placed at the heart of joyful moments with family and friends. Share the joy with Sunquick. Sunquick is made with fruit and contains no artificial flavours, colours or sweeteners. It also provides vitamin C.
Discover new ways to enjoy Sunquick through our tasty recipes.